Tom poses on the ramp by the bin. At the left hens wait for access, on the right is the tractor. Tom uses to move material from the bin every month to compost piles (one of which you can see just beyond the tractor exhaust pipe). For anyone unfamiliar with New England ways, in the early days when towns were being surveyed and chartered sometimes the folks marking the edge of one town used a slightly different line than the folks surveying the edge of the adjacent town. The difference, often a long narrow slice, was an unincorporated, townless area called a “gore”. Such an area was the 12.5 square mile “Goshen Gore” in Vermont’s Northeast Kingdom. Finally incorporated in 1867 and named Stannard in honor of Vermont General George Stannard, who became the “Hero of Gettysburg” when his troops were credited with breaking the back of Pickett’s Charge, the town also features Stannard Mountain which rises to over 2600 feet. On the west slope of the mountain, on a shoulder at an elevation of about 1400 feet, sits Black Dirt Farm – owned by Tom Gilbert and his wife Molly, with their two kids. Molly is from Leyden, Massachusetts, and Tom grew up in Brooklyn, New York – not farm country! Tom went to Evergreen State College in Washington and took about 30 percent of his credits on community scale composting systems. He met Molly there, where she was studying health and wellness. She then took a couple of years of acupuncture school, and is now a mental health therapist with a practice in Hardwick. 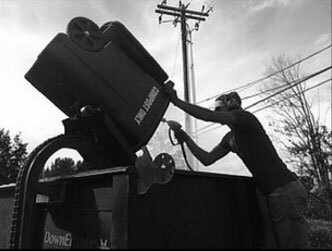 Tom has worked in composting for the last 17 or 18 years. For a while he worked for Karl Hammer at Vermont Compost, feeding food scraps to chickens, making compost, and selling eggs and compost products. Then he started a non-profit composting facility with the goal of developing decentralized systems for realizing the value of compostable materials communities already possess. “I spent 13 years running the High Fields Center for Composting,” he relates. “I don’t have any academic training for this. Most of what I know I just learned by doing it. I started out picking up food waste in the back of a Chevy S10 pickup truck. I had to replace my weak springs every couple of months! Then we went to a 24-foot box truck with a lift gate. We had twice as many containers as we needed, and we took them out empty and swapped them for full ones at grocery stores and restaurants and institutions. can be removed to give the tractor and loader access to the bin. One of Tom’s innovations was to take a critical look at the infrastructure and investments made to start up traditional composting companies. He has found ways to replace large specialized dump trucks with small trucks with motorized hoists and dump trailers. “If you have a specialized truck for this purpose in the city,” he states, “it will cost you $150,000. This whole trailer here we can fabricate for between $20,000 and $25,000. If you buy yourself a used farm truck for another $20,000 you can get into this for $40,000, instead of $150,000. At its high point High Fields was selling about a thousand yards of compost a year. It was a $700,000 per year organization with 11 employees, relatively stable but growing. So he resigned and 4 years ago they found 240 acres in Stannard to settle on. It was a diary farm until 1964 when the milk laws changed and the owners decid-ed not to upgrade. After that it was in hay for various dairy farms. When Tom and Molly bought it they were helped by a land trust which had protected the land. Tom worked off the farm the first two years and has been working full time for himself on the farm for two years. One thing which is important to Gilbert is not to specialize in any one operation or scale it up to overshadow other things he is doing. Since there are usually economies when you scale up, making an adequate income is often harder when you stay small and generalized. To address that, Tom has a plan. Picking up food scraps from restaurants and institutions, for instance, is a service for which Tom charges. He then sells many of those scraps to a farmer to feed livestock, and brings the rest to his farm. Those scraps he then feeds to chickens who not only produce eggs, but add manure to the scraps and start it along the path to becoming compost. That compost then can be sold bulk to local growers, or used as feedstock for processing by worms into castings that can be sold. 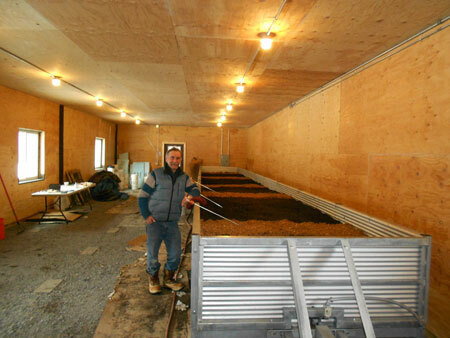 The heat and carbon dioxide given off when making compost, as well as the compost itself, can be used in hoophouses in the winter to grow crops for sale. The layers have been let into the bin to pick through the food scraps. Tom is only two years into this plan so different parts of the operation are in different stages, economically. “We make a profit on the hauling of food scraps,” he says. “Some of that we are using to get other pieces up. The egg piece covers itself at 30 dozen a week, but doesn’t generate net cash income. We sell them at the farm for $4.50, or the co-op charges $4.75 and we get $3.75. But that yields me all the compost the hens have made. If you would be buying compost at $50 a yard for your greenhouse, that starts adding up. We also sell maybe 100 yards a year bulk to neigh-bors and we bag and sell the worm castings. Right now Black Dirt Farm broiler sales fall under the $5000 organic threshold, but they are fed organic grain and Tom plans to certify them when sales in-crease. “We have a couple of enterprises,” he laughs, “which are our ‘girl scout cookies’. They make this place work financially and provide a secure income — compost pickup, worm castings, and logging in the winter. On Tuesdays Gilbert’s food scrap collection equipment is on the road picking up material. He does about 22 tons a week and of that he delivers about 15 tons to another farm and bring 7 back to Black Dirt Farm. He is working with a couple of other farms right now to deliver to them as well. The “candy cane” device on the side of the trailer dumps food scrap cans effortlessly. The equipment Tom uses is what he developed at High Fields – a truck mounted with a generator, a pressure washer, and a large supply of wash water. The trailer has dump hydraulics also run by the generator, a mechanized garbage can “candy cane” that lifts and dumps the can, and a deck to stand on while run-ning the washer and the hydraulics. Tom spent about ten years working on Vermont legislation that passed about three years ago. It is called the Universal Recycling Act and deals with all sorts of materials besides organics. It mandates the recycling of organic material over a seven-year period – phasing in generators from the largest to the smallest. The law has some provisions to encourage recycling. If you are within 25 miles of a composting or recycling facility, for instance, and if you produce over a certain tonnage in waste, then you have to use that facility. The further away the base of operations is the bigger the business, basically. Gilbert says he could grow the hauling side of his business by five times right now as he is the only player in the area. “Before the Vermont law was in place,” he recalls, “we were finding a way to fight for elbow room in the market. But then we had to price the service the same as trash, because landfilling was a competitive option, and there was zero profit. Most of that hauling was done by municipalities because they didn’t need a profit. But after the law was passed we could get a better price and make a living. 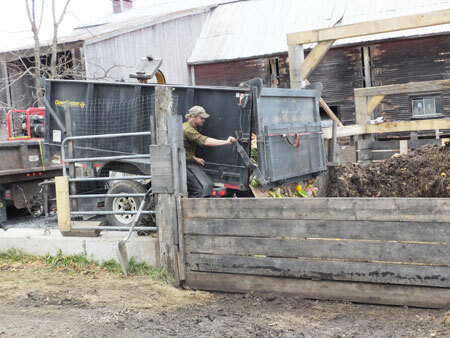 The farmer that Tom brings the 15 tons of food scraps to is not feeding it, just making compost. So he has to be a regulated composter. Of course he also farms, milking 60 dairy cows. But he uses that organic material to make compost, which is not agricultural, so he is regulated as a composter. Right now if you sell any compost you make, according to the state, you are regulated as a composter. The worm bin at Black Dirt Farm is being moved to a new building. Also, depending on where you are, regulations change. If your town has local zoning in Vermont, there is an opportunity for the town to determine whether your operation is a farm or not if some material is sold. If your town doesn’t have local zoning, then the state applies its zoning regulations. Stannard is a town of 176 people, but it has zoning bylaws, which enable Gilbert to sell some compost and stay a farm! In feeding food scraps to his chickens, Tom wants to achieve the final compost recipe in the bin while the chickens are eating. His recipe requires food scraps, wood chips, hay, horse bedding — which is basically wood chips with horse manure and urine, and sawdust. The sawdust comes in mixed with the food scraps. Gilbert delivers sawdust to the food scrap generators to add to the containers for odor control. For every container there are about 4 inches of sawdust, about a 9 to 1 ratio. The sawdust comes from wood working operations around Stannard. He collects 2 to 4 cubic yards of sawdust a week, getting it free but they do have to pick it up. He used to deliver the sawdust free but thinks now he will need to start charging for it. The wood chips he either buys from a sawmill or gets from municipalities. Their crews can unload town dump trucks right at the farm. The hay and horse bedding come from Black Dirt Farms other operations. At the end of the daily food scrap route Tom’s truck and trailer come home to the farm and back onto a homemade ramp. Then the driver will tip the load into a bin that Gilbert has prepared with layers of active compost, wood chips, and hay. The chickens forage on this for about a month, receiving a succession of four different weekly batches. The stuff further to the back of the bin has been in it the whole four weeks, so it is in a different microbial phase than the stuff most recently dumped, which is all fresh food scraps. The hens are excluded from the bin until after the dump, when they are turned in to the bin by opening a gate. 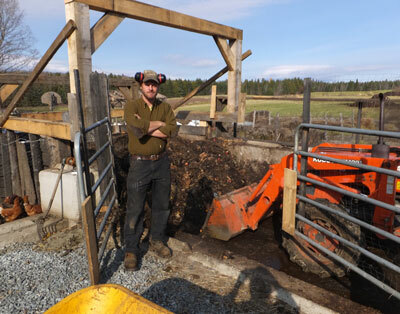 A second gate swings open to allow the trailer to dump, and a third allows the tractor to enter to remove the material after a month and to prepare for each new load with a bed of compost, wood chips and hay. You might think the chickens would prefer fresh food scraps to that which is composting. But you would be wrong! The system Gilbert uses now is all a prototype, not his long term system. They are at 170 hens right now, and the idea is to scale it up to about 2000 hens. He is constantly making changes. “This bin will have a roof in a few days,” he promises. “We have enough water coming in with the scraps and wash water. We don’t need precipitation in there as well, especially in the winter. The hens don’t like to go out when the snow is deep. Up here we are zone 3, so in January and February things pretty much stop. To make this system work the hens have to work hard then for their diets. We can make it easier with a roof on the bin. The roof will be between the housing and the composting bin too, so they basically won’t have to go outside. 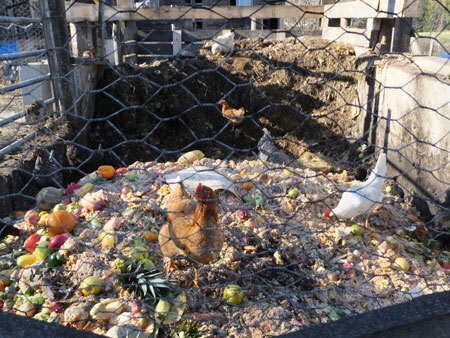 Once the food scraps are mixed and fed on by the chickens for a month they are removed and piled to bring them up to the thermophilic seed and pathogen killing temperatures and meet the organic standards. The material is then windrowed so that Tom can sell it as bulk compost or use it himself. A small amount of the compost, however, once it cools is routed to the worm bins. These are large metal containers to which new batches of compost are added on the surface. The worms come up through the material, digesting it and leaving castings. Once a week a small motor will pull a blade across the bottom and cut off the bottom half inch of castings. Gilbert feeds an inch each week on the top and cuts off a half inch from the bottom. Tom feels vermicomposting can disable pathogens in ways that are not yet generally recognized. Because health regulators don’t recognize the value of this ability Gilbert still has to meet a composting time/temperature requirement just like a chef. He has to get the pile to 131˚ F for sixteen days straight. One regulator that they have to comply with is NOFA –VT itself, which certifies the whole farm except for the eggs, whose feed can’t be certified. Even the worm castings are certified for use on organic farms. Tom produces about 25 yards of worm castings a year. As one of his operation’s ‘Girl Scout Cookies’ which makes a reliable income, he plans to expand pro-duction of the castings. But he doesn’t make tea from them because it has a shelf life. Bottled compost tea has aerobic organisms in it that need air to live. Water is a reasonable delivery method, he feels, but the microbes won’t survive in water longer than about 3 days. He is very proud of the worm compost he makes. “Our homemade mix with the castings,” he says, “when compared it to the commercial ones, typically give at least three days faster germination. It encourages cell division, cell elongation and root elongation. In terms of organic nutrients, generally castings have a high nitrogen content and a lot of soluble nitrogen. So that is a good thing for organic growers. That is a hard thing to achieve organically. One of the nice things about worms is that you can use them to make compost without fossil fuels for turning equipment. If you go to Mexico or Ecuador or Cuba, where people don’t have easy access to power and equipment, it is a good strategy to use worms. Right now Tom is trying to get to a point where he uses the compost he makes to grow produce and sell it, plus eggs, back to the same groups he picks up food scraps from, but he’s not there yet. The greenhouse he is building will be heated with heat from the composting process, and topped off with wood heat on colder nights. “Like grain going into your hens,” he says, “which is 70% of the cost, for greenhouse production it is heat which is the limiting factor. The idea with the greenhouse is that on the north end we will build a compost bin with a recessed floor and air channels in the floor. We will be able to pull air through the pile with a fan and draw it through a bin of wood chips. The wood chips will scrub out the ammonia from the compost but not absorb the carbon dioxide. Then ducts will deliver the carbon dioxide and warm air to the plants. Right now the plan is to build a small hoophouse within the north end of the greenhouse. Gilbert’s years of experience handling food waste have given him a well developed consciousness of the amount of this material which is available. Before he went to college, Tom says, he thought he’d go into wilderness education. But he’d always been involved in social activism, too. When he went to Evergreen he realized that farming is one of many doors that lead to social change.